Small- and medium-sized businesses (SMBs) are vital creators of wealth, income, and jobs in the global economy. For example, they make up 99.9% of all private sector businesses in both the US and the UK, and they employ 60% and 48% of all workers in those countries, respectively. The income and assets of these businesses make them an irreplaceable customer base for financial institutions. However, incumbent financial institutions are falling short of SMBs’ lending wants and needs. Fintechs — including alt lenders, payment providers, and lending platforms — are changing the SMB lending space by filling that gap and capturing an increasingly large sliver of the SMB lending market. For example, alternative financial providers only accounted for 2%, or £11.5 billion ($14.7 billion), of the UK SMB lending market in 2018. However, their share is projected to surge to 9.1%, worth £52.6 billion ($67.4 billion), by 2021. 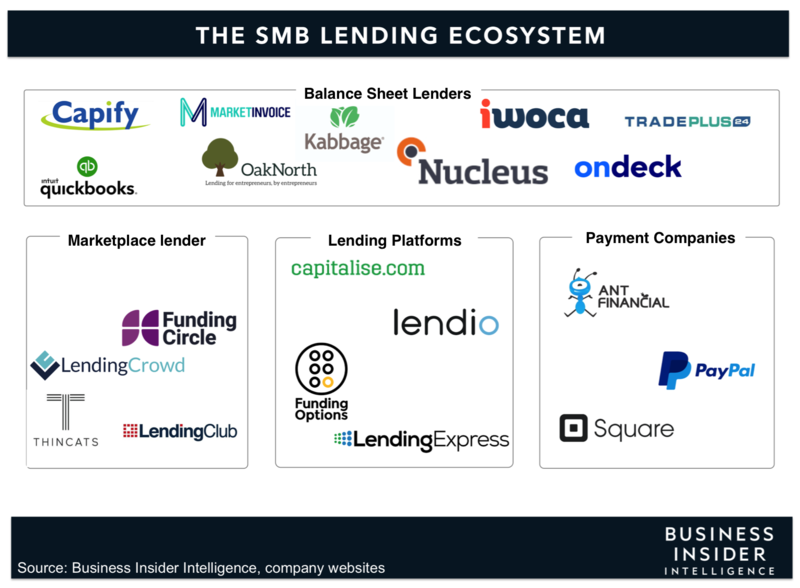 In the SMB Lending Report, Business Insider Intelligence will examine the key players in the SMB lending space, determine the advantages of each player, and discuss how incumbents can improve their offerings to better serve SMBs and stave off the growing competition from alt lenders in the space. Additionally, we will look at what the future of SMB lending will hold. The companies mentioned in this report are: NatWest, BNP Paribas, Esme Loans, OnDeck, ING, Kabbage, Funding Circle, Lending Club, PayPal, Square, Lendio, ING, Funding Options, INTRUST Bank, Behalf, Lending Express, and Fundbox, among others. SMBs are underserved by conventional lenders, so fintechs are increasingly offering digital services tailored to meet SMBs’ wants and needs. Some incumbents have already woken up to the opportunity of better serving SMBs and leveraging this revenue stream, but the majority are still unaware. This has given fintechs the opportunity to grow their market share among SMBs. If incumbents don’t fight back with their own digital services, they will like lose further share to fintechs. There are three main ways incumbents can revamp their SMB lending products, each of which requires a different level of effort: partnering with fintechs, developing tech-enabled solutions in-house, or launching their own challenger products. Outlines the current state of the SMB lending space. Details the different players that are involved in SMB lending. Explains three ways in which incumbents can up their SMB lending game and fight off competition. Highlights the benefits and hurdles that come with each of those strategies. Discusses what the future of the SMB lending space will hold.